I have piles of clutter that threaten to topple upon me causing serious bodily injury – maybe even death – so I have vowed that it’s time to live with only the things that I truly love and get rid of the rest. Excess stuff causes us stress (living with piles of stuff surrounding us is exhausting), money (we buy things we already own but either can’t find or forget we have) and time (the constant search for that thing we can never find). It’s time to free ourselves of the excess and focus only on what brings us happiness with these decluttering tips. Let’s face it, we would have tossed most of this stuff long ago if we didn’t have some weirdly dependent thing going on. Time to focus and look at each and every item we own and if we haven’t used or worn it within a year it’s time to donate it (or toss it) to someone who will love it (remember, it’s just stuff). Donate, Trash, Keep (this one should be the smallest!). Torn on what to do? Put those few things you just aren’t sure about in a box, put the box in an out of the way spot like the basement and revisit it in six months. Chances are, you’ll have an easier time letting go once you realize you haven’t missed anything. Start what you finish instead of hopping from room too room. Dump the contents of a drawer out then sort through it and you’ll be amazed at how much ends up in the trash. With each organized area, it will get easier. Can’t stand to part with little Billy’s three foot pile of drawings from Pre-K? Take pictures of your little Picasso’s artwork and print out a little booklet that you can keep on your coffee table and actually admire (and toss the originals that have probably been gathering dust in the basement anyway). I gave my girls garbage bags and told them to fill them up with anything they didn’t use or need anymore. I’m still a little distraught over the fact that they tossed my original Tickle Me Elmo doll but seeing their rooms with some semblance of order more then makes up for it (tip – check their bags before you donate if you don’t want them tossing something of value). Make storage a priority for the things you keep because if you can’t see it, you’ll forget about it and you’ll probably buy more of it and then the clutter will begin again. Only purchase baskets, bins and storage containers after you declutter so you’ll know exactly what you need. You’ve Done It – Now What? The hard part is over – now keep up the good work with a weekly purge. Do a clean sweep of tabletops, closets, drawers and paperwork then sit down to your spotless table and enjoy a glass of wine. Now that you have the world’s most organized home, be picky about what you bring into it. Buy it only if you love it and can’t live without it and have a place for it (you can always sell something that you don’t love on Craigslist). Can’t resist that cute new pair of peep toe sandals? Go ahead and buy them but donate a pair of shoes in the process. For everything you buy, donate (or toss) one thing (this will make you extra picky at the check out counter). Don’t forget to read my Facebook Sell Group Tips to earn some cash quickly and easily! Your sanity is more important than buying that 15th coffee mug. 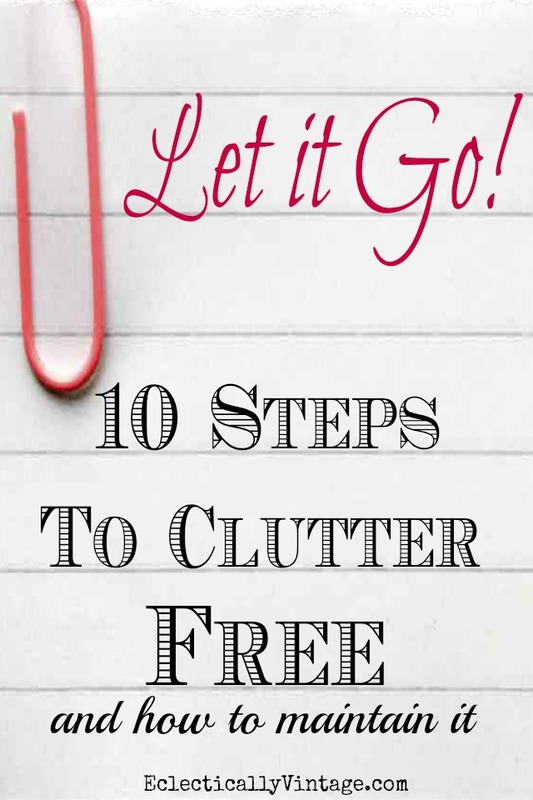 Don’t forget to join my Conquer Clutter Challenge! we’ll inspire, motivate and share tips to finally declutter once and for all! Who’s with me? Let’s make this the year we live mindfully and with less stuff and less stress. Please leave your tips for getting and staying organized in the comments – because we’re all in this together. Thanks for reinforcing something I was working on yesterday! I am trying to purge the stuff in my creative space. Hard to do when I think everything is a future element of an art piece, lol! But I am making progress! It is hard to imagine your home having any junk / clutter in it at all Kelly, it always looks so nice! Agree – I always think – well someday I may use this! It’s something we have to stop doing if we don’t want to drown in our stuff!! And I do have clutter – I usually just move my piles around behind the camera!! So apropos for my day… I am purging Little Jimmy and Little Jeff’s school drawings… (they are 44 and 46! )… I gave them each a big envelope of pictures and school things as part of Christmas, and I am already gathering more. Some are going straight to the trash, but I like the idea of taking a picture and keeping a booklet. After all, when I am gone, who will care? That’s sweet that your mom kept your baby clothes Mary Ann! I am guilty of keeping way too much of my girls stuff too – that art really adds up! Vintage items like that are rare especially if they are in good shape. You can have them framed in a shadow box or you can sell them. Just don’t throw them away. Their are collectors out there who would love to purchase them from you. I love the idea of donating to friends and those that could really use our castoffs – good luck Eloise! I find that the older I get, the easier it is to “let it go”….and “shake it off” …. Happy Monday Kelly! Rule #1 is the hardest one for me! Unfortunately, the only thing that works for me is moving. YES Kelly! You nailed it…clutter can be debilitating! I so believe in everything has it’s place. Not only does that thought process help with putting things away (and everyone hopefully knows where these places are), but it does help in double buying. I do struggle in some areas like shoes and clothing, but I do try and purge at least every season. I am going to start in baby steps lol. I’m a scrapbooker, and I have incorporated the kids artwork into my pages. Instead of purchasing a turkey diecut, I use the cute one they made in preschool. I’m still preserving some of the artwork…but it’s not in a box in the closet. And…. not every work of art makes the cut. I like and practice your ideas so it is nice to keep doing it with other’s ideas too! I strongly believe in donating anything that isn’t broken or in need of repair. I shred the papers I feel cannot go straight to the recycle bin. I donate magazines, books to our local library. I do not like to buy things that I cannot store so I really think about where a new item will live! The one item in and one item out is a must for me. This is my year to let go of the cute stuff and see more value in what I use-not what I store! 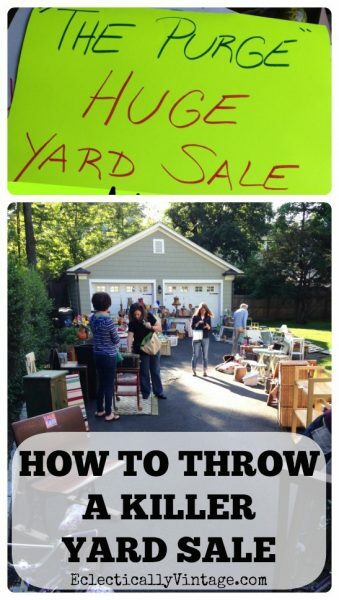 Planning a big yard sale, too. Great way to think Debbie! I threw a huge yard sale last year and it was a lot of work! Then I ended up hauling everything that didn’t sell to the thrift store! This is probably the simplest, most direct article on decluttering I have ever read. May I add most inspiring…lol? Thank You so much. Thank you so much! Decluttering is overwhelming and I’m all about an easy approach! Thanks for sharing! I like that you say that one must be a robot. Stuff should just be things that improve life, but sometimes easier said than done. So true Vanessa! The struggle is so real! I wish I would have seen the “start one room at a time” prior to my disaster. I got bogged down in a room so I went to another room, another closet, another cupboard, etc. I have the biggest clutter disaster ever!!!! And I don’t seem to be able to climb out from under it. It is truly paralyzing my life. I hear you Cynthia! It’s so hard and the clutter has crept back in on me too. We need to keep at it every day – you can do it!